Princess Sibylla of Saxe-Coburg and Gotha (Sibylla Calma Marie Alice Bathildis Feodora; 18 January 1908 – 28 November 1972) was the mother of the current King of Sweden, Carl XVI Gustaf. A member of the House of Saxe-Coburg and Gotha, Sibylla became a Swedish princess by marrying Prince Gustaf Adolf, Duke of Västerbotten, who did not live to ascend the Swedish throne. Sibylla (then Sibylle) was born at Schloss Friedenstein on 18 January 1908 as the elder daughter and second child of Charles Edward, Duke of Saxe-Coburg and Gotha, and Princess Victoria Adelaide of Schleswig-Holstein, a daughter of Princess Karoline Mathilde of Schleswig-Holstein-Sonderburg-Augustenburg and Friedrich Ferdinand, Duke of Schleswig-Holstein, and descended from an older Scandinavian royal house. Through her father, she was a great-granddaughter of Queen Victoria of the United Kingdom. Her paternal grandfather was Prince Leopold, Duke of Albany, the youngest son of Queen Victoria and Prince Albert. 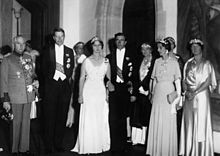 In November 1931, Sibylla was in London to attend the wedding of her paternal first cousin Lady May Abel Smith as a bridesmaid. One of the other bridesmaids was a distant cousin Ingrid of Sweden, who introduced Sibylla to her brother, Prince Gustaf Adolf, Duke of Västerbotten. Their engagement was announced at Callenberg Castle in Coburg 16 June 1932. Wedding of Princess Sibylla and Prince Gustaf Adolf of Sweden in Coburg in 1932. On 19 October in Coburg, Sibylla married her second cousin Prince Gustaf Adolf of Sweden, Duke of Västerbotten, in a civil ceremony, followed by a church wedding the day after. Gustaf Adolf was the eldest son of Crown Prince Gustav Adolf of Sweden (later Gustaf VI Adolf) and Princess Margaret of Connaught, a granddaughter of Queen Victoria. 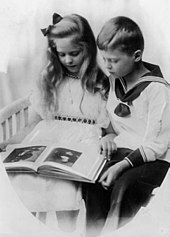 Both Sibylla and Gustaf Adolf were great-grandchildren of Queen Victoria. 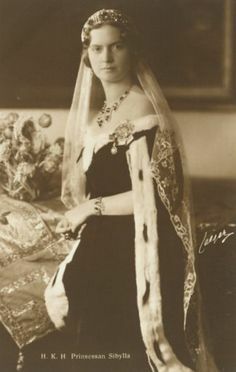 Sibylla never became Crown Princess herself since her husband died before his father and his grandfather King Gustav V.
The wedding was celebrated in an official manner in Coburg, as President Hindenburg had ordered that no honours should be spared. However, as the city of Coburg was dominated by the Nazi party at the time, the celebrations there were Nazi influenced, which made a very bad impression in Sweden. The ceremony took place at St. Moriz. The couple spent their honeymoon in Italy before arriving in Stockholm on 25 November 1932. Princess Margaretha (born 31 October 1934) she married John Ambler on 30 June 1964 and is his widow. They had three children. Princess Birgitta (born 19 January 1937) she married Prince Johann Georg of Hohenzollern on 25 May 1961 and is his widow. They had three children. Princess Désirée (born 2 June 1938) she married Baron Niclas Silfverschiöld on 5 June 1964 and is his widow. They had three children. Princess Christina (born 3 August 1943) she married Tord Magnuson on 15 June 1974. They have three sons. The couple settled at Haga Palace, and their four daughters were to be commonly known during their childhood as the "Hagaprinsessorna" (English: "The Haga Princesses"). Sibylla shared her husband's enthusiasm for sport and outdoor activities, and the couple owned a cottage in Ingarö and another one in Storlien. Sibylla was also a keen supporter of the Swedish Girl Guides movement. During her lifetime, she was appointed chairman of various organisations such as Sällskapet Barnavård (English: "The Childcare Society") in 1948 and the honorary chairmanship of the Hörselfrämjandet (English: "The Hearing Society") in 1935; the Sveriges flickscoutråd (English: "The Swedish Girls Scouts") in 1939; Kvinnliga bilkåren (English: "The Women's Automobile Force") in 1939; the Stiftelsen Solstickan (English: "The Solstickan Society") in 1941; and the Stiftelsen Drottning Victorias Vilohem på Öland (English: "The Queen Victoria Resting Home in Öland") in 1951. In 1938, she founded the Prinsessan Sibyllas S:t Martin-stiftelse (English: "The Princess Sibylla Foundation of St Martin"). Sibylla became a widow in 1947 when Gustaf Adolf died in an airplane crash at the Copenhagen Airport in Denmark. Their only son, Carl Gustaf, became second-in-line to the throne at the age of nine months and, later, Crown Prince at the age of four. In 1950, Sybilla moved from Haga to the Royal Palace of Stockholm. During the summers, she stayed at Solliden. During these years, she developed an interest in environmental issues. After her stepmother-in-law, Queen Louise, died in 1965, Sibylla became the highest ranking woman in the royal family. She took over her duties in support of her father-in-law, King Gustaf VI Adolf. During these years, she enjoyed somewhat more popularity, as she was more exposed, and as her humour and sense of self-irony became more known and appreciated. 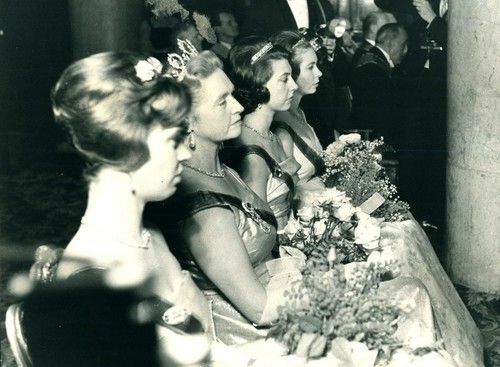 She continued with the so-called "Democratic ladies lunches" for career women instigated by Queen Louise in 1962 as a replacement for the court presentation. Sibylla died in Stockholm of cancer less than a year before her son ascended to the throne. ^ "Prinsessan Sibylla 100 år". kungahuset.se. Retrieved 17 March 2018. ^ She is shown in a photo wearing a Guide uniform with her husband at a reception (see his article). ^ "Wearing the medal of the order on her left chest" (JPG). S-media-cache-ak0.pinimg.com. Retrieved 14 December 2017. ^ "Photographic image" (JPG). Upload.wikimedia.org. Retrieved 14 December 2017. ^ "Photographic image" (JPG). S-media-cache-ak0.pinimg.com. Retrieved 14 December 2017. ^ "Photographic image" (JPG). 1.bp.blogpsot.com. Retrieved 14 December 2017. ^ "Photographic image" (JPG). 4.bp.blogspot.com. Retrieved 14 December 2017. ^ "Geheugen van Nederland". Geheugenvannederland.nl. Retrieved 14 December 2017.